The fourth edition shows your students what the discipline is all about—its main concepts and applications—while also instilling an appreciation and excitement about the richness of the subject. Visualizing Environmental Science employs uniquely designed visual pedagogy to help students acquire the skills they need to become better learners. The 4th edition has refined and expanded the visuals using insights from research on student learning and feedback from users. Significant expansion of graphical representations of information, including additional graphs and tables throughout the text and a particular emphasis on the start of each chapter. Each chapter now opens with a representative story that includes prose, compelling imagery, a visual display of information, and a challenging question about the story to further engage the reader. Sustainable Citizen” questions have been added to the end of each chapter. New data on worldwide energy trends, including solar thermal and wind electrical generation and biomass ethanol consumption. New, Additional graphs associated with many photos throughout the text as well as with all chapter openers to reinforce the importance of data and graphing in environmental science. New to this WileyPLUS for Environmental Science, are Smart Science® Graphing Activities, which allow students to work through the scientific process by collecting and graphing real data, then thinking critically about what the data demonstrates. Visualizing Environmental Science employs uniquely designed visual pedagogy to help students acquire the skills they need to become better learners. The 4th edition has refined and expanded the visuals using insights from research on student learning and feedback from users. The Visualizing approach uses a variety of research-based visuals to engage students so they become active participants in the learning process. 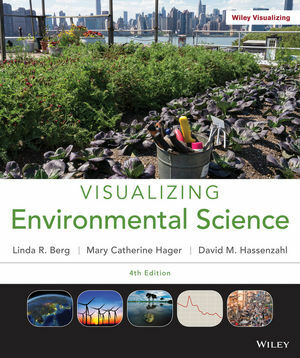 The 4th edition of Visualizing Environmental Science immerses students in course material through visuals (both in print and rich multimedia resources) while organizing complex processes and related course information into easily digestible segments.